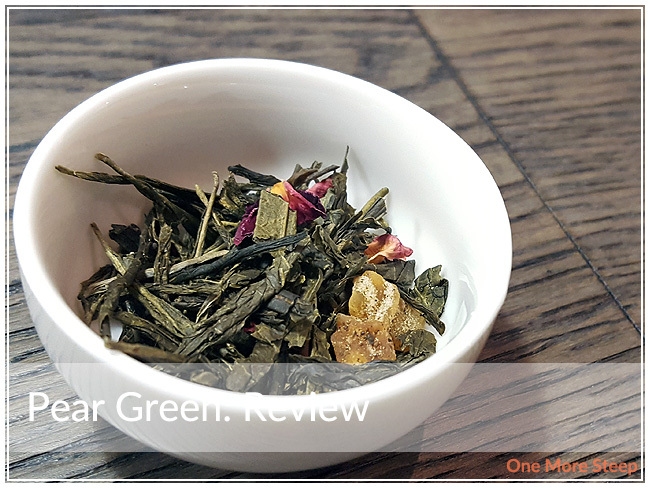 Pear Green is one of the teas that I picked up at the 2017 Vancouver Tea Festival at ShakTea’s booth (the others being White Grape and Morning Dew, both previously reviewed here). Pear Green was a tea that I was able to smell in person, and it’s got such a bright fruity aroma to it! The fragrance from this tea is primarily that of the pear, and I smell very little of the roses beyond a hint of floral in the background. The ingredients in Pear Green are: green tea, pear pieces, and rose petals. 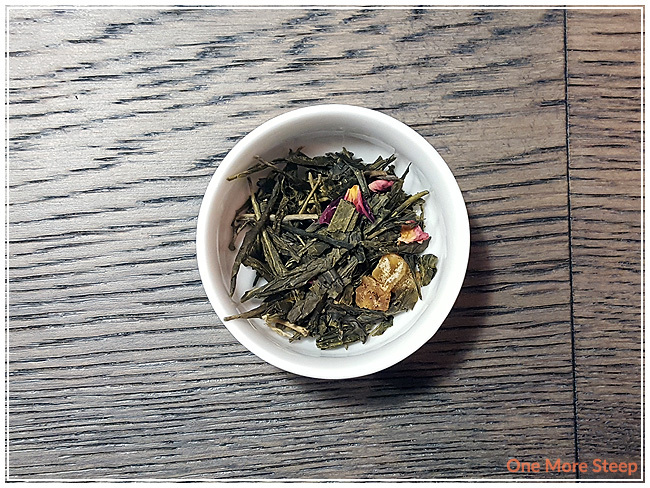 You can definitely see all of the ingredients in this green tea blend. The pear pieces are quite generous in size and smell so good. There weren’t any preparation instructions for Pear Green on the packaging or the website’s product page, so I did an initial steep of this green tea blend at 79°C/175°F for 2 minutes. Pear Green steeps to a pale yellow after two minutes. The aroma from this tea is mostly fruity sweetness, with just a slight bit of rose. 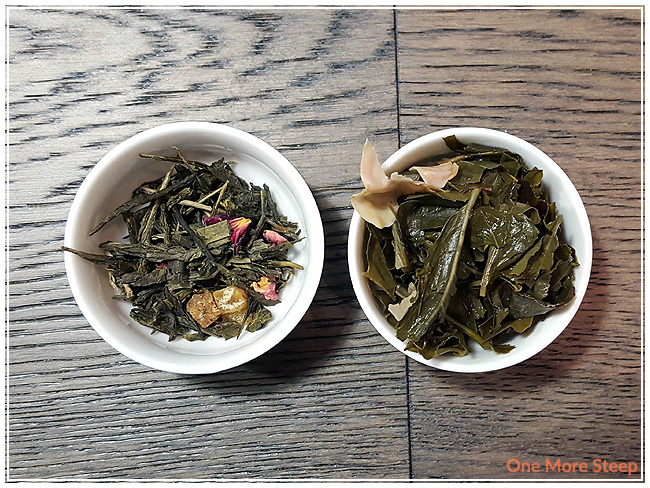 When I sip this tea, I find it to be enjoyable – there’s definitely some sweetness from the pear, I can taste the roses, and the green tea base is mostly in the background. There’s just a hint of grass notes mingling there, being overwhelmed by the pear and the roses. I resteeped Pear Green twice, adding an extra 30 seconds for each steep. I found that the green tea base flavour keeps fairly consistently, while the pear and rose (while present) continued to get weaker. There’s still that fruity sweetness with the two resteeps, so I did quite enjoy both resteeps. If you’re after a strong pear flavour, I would say that the first steep is the one for you. I loved ShakTea’s Pear Green. 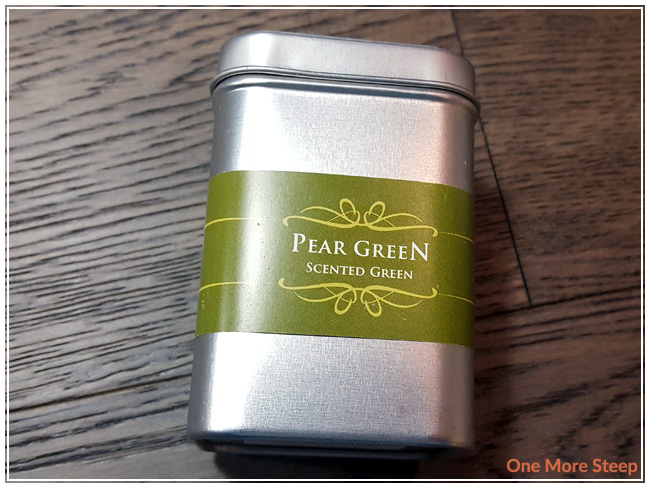 I found the pear flavours of this green tea blend to be very enjoyable and added a great natural sweetness to this tea. 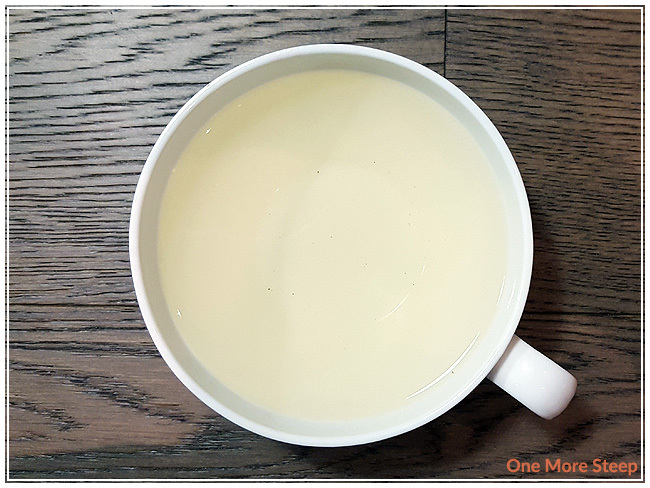 I felt like the ingredients lived up to the name of this tea, and it was nice that it resteeped fairly decently, especially being a tea with fruit and floral ingredients. I think this would be a nice tea to pair with a meal, mostly because the grassy notes would play off a savoury meal while the pear and rose would partner nicely with a dessert.